Marty Glynn hasn't lost his taste for potatoes—even though he and co-workers routinely process more of them into french fries, chips, and dehydrated flakes each month than the average American eats in a year (more than 140 pounds). "We still nibble some chips every now and then, but I prefer the kind you buy in a bag. Plus, ours aren't seasoned," says the food technologist with ARS' Potato Research Worksite in East Grand Forks, Minnesota. There, Glynn oversees the day-to-day operations of a cooperative potato research program involving ARS and nine state universities. Researchers evaluate the storage and processing characteristics of new, up-and-coming potato germplasm—from the tasty round reds sold as table stock to the oblong Russets used for processing and baking. For plant breeders who submit tuber samples, such testing helps ensure they're on track to developing a finished potato that will give good yields, store well, and satisfy industry's standards for product quality. potatoes for frying and evaluation. "A lot of new potato germplasm looks good in the field but doesn't hold up in storage or processing. Or some may process well at 45 °F but not at 42 °F," Glynn explains. That's not to say such lines will be of little use to growers as a commercial variety, though. The scientists are experimenting with new storage regimens that cater to a particular tuber's storage and processing capabilities. "If we know the potato's storage and processing characteristics," says Glynn, "we can determine new and better ways to store them and set up protocols for ensuring product quality." Fall is an especially busy time of year at the worksite, Glynn says. That's when breeders submit promising new tuber samples harvested from their breeding lines for analysis. The worksite boasts more than 46,000 cubic feet of temperature-controlled storage units. It also houses the latest in dehydration equipment and a french fry and chip processing line that's 1/20th the scale of a commercial operation. From the blanchers and cutters to the oil fryers, "everything is like industry," Glynn says. On arrival, new samples are placed into storage units cooled to one of four temperatures: 38°, 42°, 45°, and 48 °F. "We process some of the potatoes for chips, some for french fries, and others for dehydrated products like instant potato flakes. We also evaluate table stock potatoes for fresh market," Glynn says. "All samples are stored, processed, and tested the same way so that the results are comparable. The only variable is how the plant breeders treat the samples before submitting them." 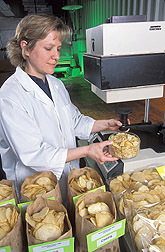 For one test, a device called a reflectometer is used to measure the degree of whiteness in processed tuber samples destined to become chips. "Right now, industry wants everything as white as a sheet of paper," Glynn notes, adding that the worksite's color rankings are based on criteria set by the Snack Food Association. Besides reflectometer tests, chemical analysis is also performed to measure concentrations of simple, or "reducing," sugars in the tubers' flesh. "The less reducing sugar you have, the whiter the potato chip you get," Glynn says. For french fries, evaluations include color, length, and limpness—whether or not the fries droop over. 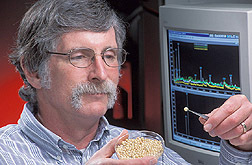 The job of tasting samples and checking their texture rests with a trained panel of sensory experts at North Dakota State University, in Fargo. Fresh-market testing includes checks for internal defects, like hollow heart, and external defects, such as deep-set eyes and bruising. On average, the worksite's scientists and support staff conduct 14,000 to 15,000 quality tests annually, with about 1,000 new germplasm submissions arriving each fall. "There's not a lot of downtime," says Glynn. "If we get a sample in October, we'll test it immediately and reevaluate it periodically thereafter until mid-June or July. Test results are made public as soon as possible to help breeders make the next year's selections." Jeffrey Suttle, an ARS plant physiologist who collaborates with Glynn, points out that the ARS worksite "is the only public facility in the country where such comprehensive storage and processing evaluations are done on a routine basis as a service to the potato industry." A condition of such testing is that the results be made public through trade journals and other media, says Suttle, who is research leader of both the worksite and the Sugarbeet and Potato Research Unit at ARS' Red River Valley Agricultural Research Center, in Fargo. healing in a damaged potato. NorValley, Snowden, Dakota Pearl, NorDonna, NorChip, and Dark Red Norland are a few notable graduates that have passed through the worksite's doors en route to commercial success. Besides helping with evaluations, Suttle conducts potato postharvest physiology studies with ARS chemist Edward Lulai to decipher the biochemical mechanisms that regulate sprouting and wound healing in stored tubers. "Our research objective is to identify key physiological processes that can be manipulated to improve postharvest storage," Suttle says. Along with rot diseases and physiological disorders, such as tuber shrinkage and sugar-end defect, wounds and sprouting cost the U.S. potato industry and consumers more than $300 million annually in postharvest losses. 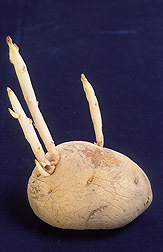 Such problems can claim between 5 and 40 percent of a stored tuber crop. "Unlike grains such as corn that are stored dry, potatoes are stored in a fully hydrated and highly perishable form," Suttle explains. "Plus, the potatoes are stored uncleaned and at temperatures favorable to attack by disease organisms." Storage managers can manipulate the warehouse environment to promote wound healing, but there isn't a product available for treating the tubers directly, notes Suttle, who cites a lack of earlier, in-depth research on the topic. One possible lead may come from recent discoveries at Lulai's lab. He demonstrated that natural waxes in a tuber's skin—called phenolic and aliphatic polymers—are needed to form a chemical barrier around wound sites. This shield seals water in but keeps disease organisms out. "Once you know what you're looking for," says Suttle of tuber physiology, "you can genetically select for it or design specific, environmentally benign compounds to manipulate key biochemical processes." The Fargo researchers also apply that mindset to controlling sprouting, which is undesirable in stored potatoes because it results in the loss of both nutritional and processing qualities and favors disease development. A chemical known as CIPC (isopropyl-N-[3-chlorophenyl]-carbamate) is widely used to control sprouting. About half the nation's roughly $2.5 billion crop is treated with the chemical to extend storage time and improve marketability. Despite such widespread use, CIPC faces ever-tighter regulation. In seeking more benign alternatives, the Fargo lab has devised a novel tissue culture technique for identifying dormancy-controlling hormones and determining their interactions that ultimately lead to sprout growth. Thus far, three key hormones have been identified in these studies: abscisic acid and ethylene, which usher in dormancy; and cytokinins, which stop it so sprouting can begin. 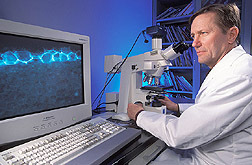 In the lab, the technique involves snipping a leaf from a very young potato plant and placing it in an agar growth medium. Chemicals that either inhibit or stimulate synthesis of hormones are added to reveal their effects on tuber dormancy. Suttle says compounds that increase abscisic acid or ethylene levels lengthen dormancy, while chemicals that block abscisic acid and ethylene synthesis—or stimulate cytokinin synthesis—accelerate sprouting. "With the tissue culture system, you can manipulate the chemical and physiological environment as the potato plantlet or tuber grows, right from the start, and see how that affects tuber dormancy," Suttle explains. "It's an experimental system that opens avenues you just can't follow with field studies." In other work, Suttle says, "We're pushing hard to develop our program in the postharvest maintenance of value-added traits, such as vitamins, nutraceuticals, and proteins, or medically important materials such as antibodies. Postharvest storage deterioration affects all aspects of potato composition, including these traits. "—By Jan Suszkiw, Agricultural Research Service Information Staff. Martin T. Glynn is at the USDA-ARS Potato Research Worksite, 311 5th Ave. NE, East Grand Forks, MN 56721; phone (218) 773-2473, fax (701) 795-8348. Edward C. Lulai and Jeffrey C. Suttle are in the USDA-ARS Sugarbeet and Potato Research Unit, P.O. Box 5677, 1307 18th Street N., Fargo, ND 58105-5677; phone (701) 239-1257, fax (701) 239-1349. 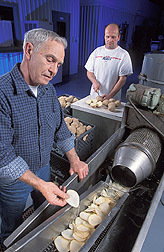 "Spud Hub" Tests Potatoes' Fitness for Market" was published in the July 2003 issue of Agricultural Research magazine.